Image caption The novel is described as "a series of reflections and conversations"
The previously unpublished first novel by Sir Arthur Conan Doyle will finally be available to buy from Monday. Entitled The Narrative of John Smith, the novel - written between 1883 and 1884 - comprises the reflections of a man confined to his room by gout. Conan Doyle sent it to a publisher but it was lost in the post. The book was then reconstructed from memory. The British Library is now releasing the novel, alongside an audiobook read by actor Robert Lindsay. The four notebooks that comprise the manuscript form part of an exhibition that runs at the Library until 5 January. "This publication and exhibition show that there are still new things to discover about this iconic literary figure," said Rachel Foss, who co-edited the novel. "It's a testament to the richness of Conan Doyle's life and the archive he left behind him... that we can still unearth such little-known gems." The novel has been part of the Library's collection since 2007 and is being published with the consent of the Conan Doyle literary estate. The author continued to revise the text and drew on passages from it in his later writings but he never re-submitted the novel for publication. "My shock at its disappearance would be as nothing to my horror if it were suddenly to appear again - in print," he once joked. 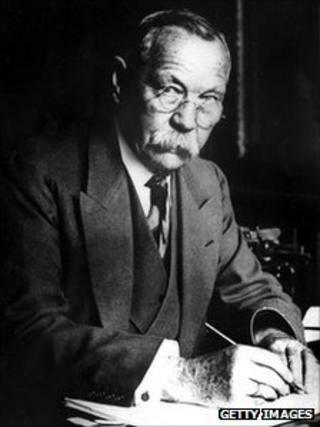 According to Jon Lellenberg of the Conan Doyle Estate, the author was "fortunate" that his first stab at penning a novel went unpublished in the 1880s. Even so, he continued, the text offered "a unique window into the mind, thinking and often emphatic opinions" of the Sherlock Holmes creator. The novel was written while Conan Doyle was in his early 20s, just after he had moved to Southsea, in Portsmouth.